What was bound to happen all along has now materialised: Mel Zelaya, the bourgeois leader of the resistance to the Honduran military coup, has ended up giving up everything in exchange for nothing. Signing the “Gaymuras-San José” accord (supervised by the Obama administration) he has capitulated. It is clear that the the US government proposed him a ‘double standard’ deal: Zelaya had to sign the deal, the other side only to make a vague promise eventually to “reinstall” him. An article by Socialismo o Barbarie‘s Honduran section on the peace accord signed by centre-left president Manuel “Mel” Zelaya with the régime established by Roberto Micheletti after a military coup against Zelaya four months ago. 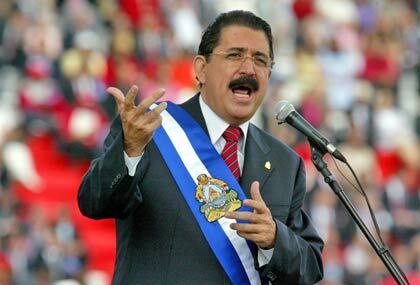 On 28th June the centre-left president of Honduras Manuel ‘Mel’ Zelaya was overthrown by the military and forced into exile. This was followed by months of civil disobedience which raised wider democratic arguments but was subject to murderous state repression. 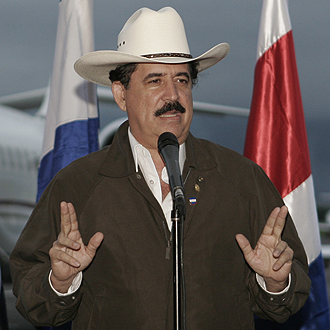 Last month saw Zelaya’s return to the country – forced to take refuge in the Brazilian embassy – and now he has agreed to power-sharing and fresh elections in a deal with the coup régime headed by Roberto Micheletti. Below appear some first impressions from a member of the Socialismo o Barbarie current. Four months ago Honduras’ centre-left president Manuel “Mel” Zelaya was deposed and forced into exile by a military coup, sparking a long resistance campaign in which twelve trade unionists have been killed. Now Zelaya is back in the country and negotiating elections with the coup régime of Roberto Micheletti (depicted below). But as Socialismo o Barbarie argue, this national unity means legitimising the coup and stepping back from democratic reforms. 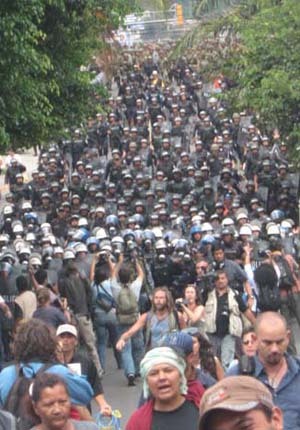 Mel Zelaya has given fresh “space” for negotiations with those who conducted the military coup. This is Zelaya’s strategy: bending over backwards as far as possible, abandoning each and every one of the demands which the popular resistance has stood up for in the streets every day, since the very day when the coup régime seized power. Zelaya has now given up the central demand of this struggle: a Constituent Assembly. The October issue of our monthly paper The Commune is now available. Click the image below to see the PDF, or see articles as they are posted online in the list below.